We Are Fine, We'll Be Fine is an audio documentary played on a wooden game board exploring people's stories about marginalization, oppression and the navigating hope for the future. Participants unravel stories of struggle and hope by holding hands with each other while touching the board. As they progress towards the center of the board, more stories emerge. One of the goals of our project is to provide an interactive experience amplifying the voices of "the unheard". We focus on the underrepresented members of society (touching upon stories of feeling like the "other" because of one's gender, sexuality or race among others). By rethinking how we tell these stories (i.e. 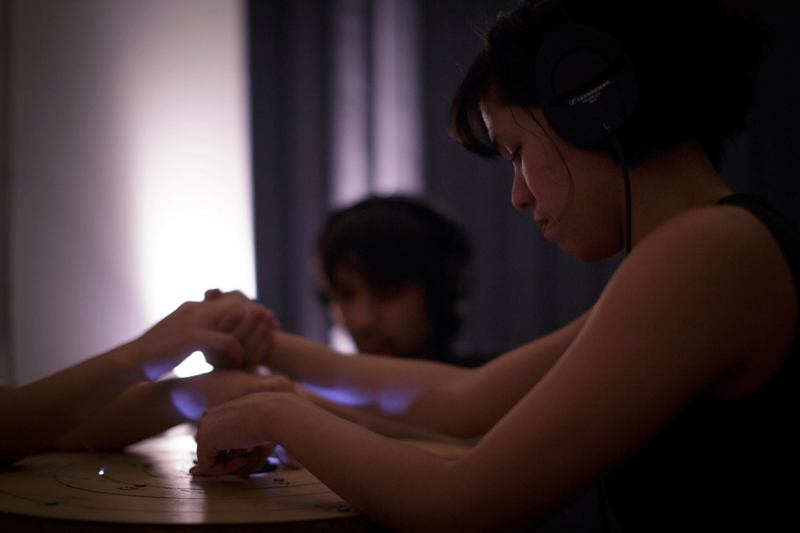 by using games and alternative controllers like our bodies as "interfaces"), we believe that this can lead to unique player experiences offering an inward-looking moment of introspection and an intimate shared experience. We Are Fine, We'll Be Fine was originally conceived during Critical Hit's 2015 Summer Game Incubator at Concordia University. The first prototype of the game - then known as "Utopia" - was created by Owen Bell, Kara Stone, Raoul Olou and Nicole Pacampara as part of the Game Jam Phase of the incubator (Cycle 3). Responding to the jam's theme of critical subjects, we wanted to make something that recognized oppression while offering visions of hope. During the final/polishing phase of the incubator, Hope Erin Phillips joined Raoul Olou and Nicole Pacampara to refine and reimagine the game. Looking back at "Utopia", the team felt the strongest part of that prototype was the stories people told. For the final game, they wanted to find a way to not only emphasize these stories but also deliver them through meaningful interactions fitting the game's themes. 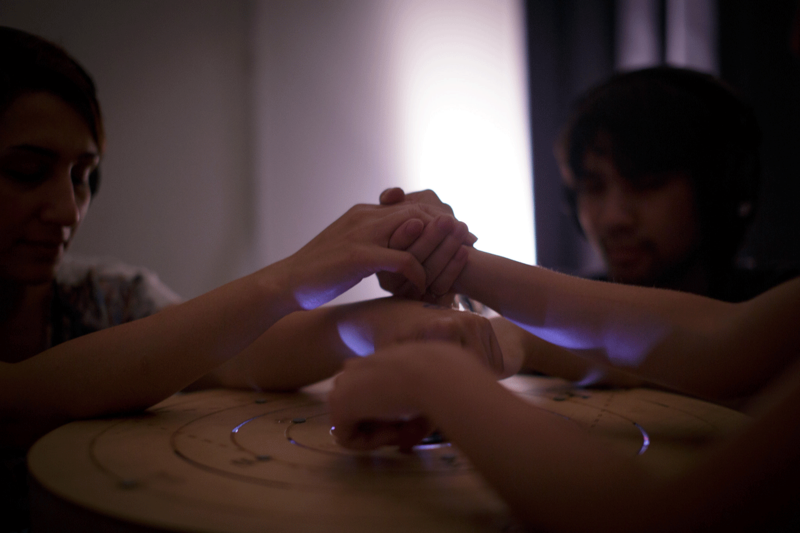 After hours of brainstorming, playtest and paper-prototyping, the team ended up with the idea of a wooden board and the act of holding hands. The game works through skin connection with other players. 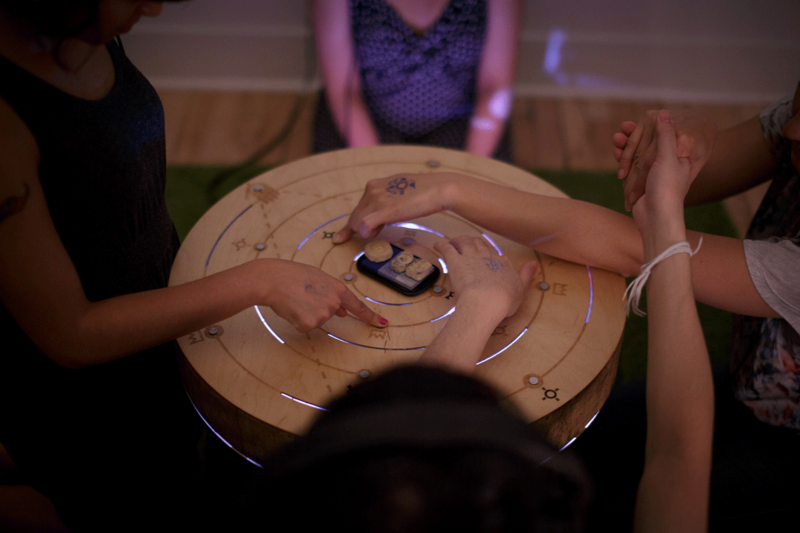 To start, three players gather around a wooden board. 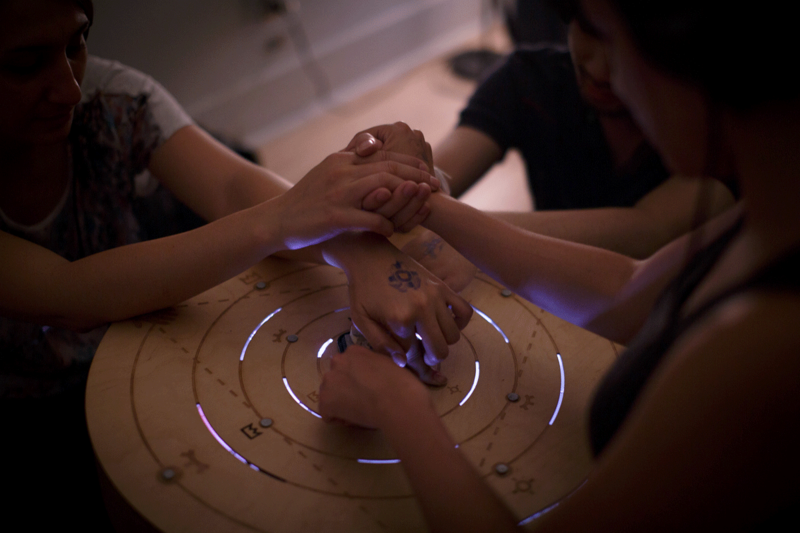 While holding an icon on the board, players make a connection by holding hands with each other. This connection activates audio stories relating to people's experiences with oppression, marginalization and their hopes for the future. Different connections (i.e. holding hands with another person) unravel different stories. The game ends once players have reached the centre of the board and have listened to all the stories. There are far more images available for We Are Fine, We'll Be Fine, but these are the ones we felt would be most useful to you. If you have specific requests, please do contact us! There are currently no logos or icons available for We Are Fine, We'll Be Fine. Check back later for more or contact us for specific requests! "...works hard to make hand-holding an active part of play, and succeeds. One of the best experiences of simply listening to someone else speaking about themselves. Also the physical board object that is the centre of the game is very, very impressive." "With [We Are Fine], Team Sagittarius turned othering into togethering. ❤ #differentgames2016"
"Love [it] so much! Reminder that communication is how we fight back against alienation and stigma." 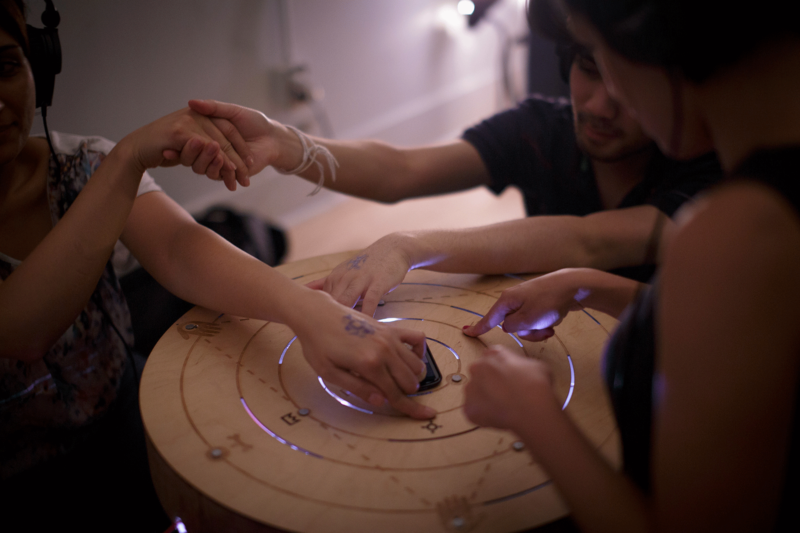 "[The game] is sheer brilliance and beauty and boldness...Hands down my fav game at #MakerFestivalTO." "Played [We Are Fine]! 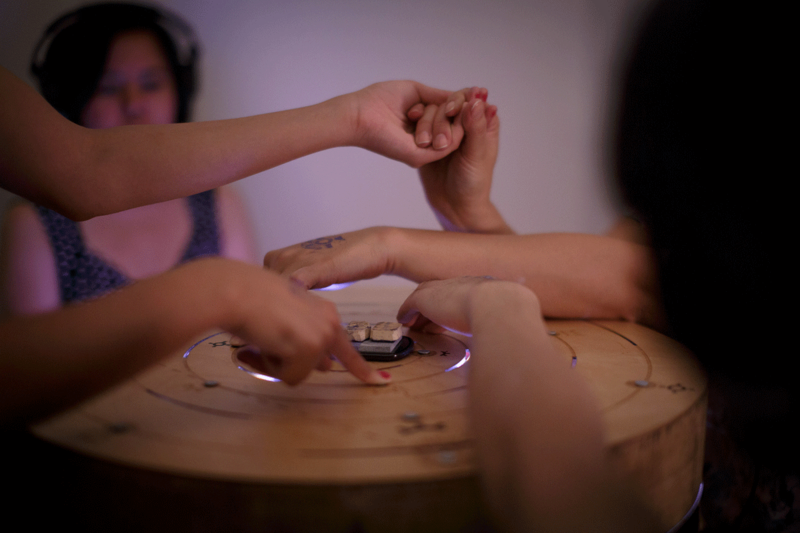 Imprinting player icon, holding hands with other players to advance the stories was magical." "Really interesting and empathetic game...it was a great experience and I love the table itself." Stories from the creators of "We Are Fine, We'll Be Fine" medium.com. An interview talking about our motivations for the project (for our original prototype, "Utopia") concordia.ca. This project was made possible through the Technoculture, Art and Games Research Center's Critical Hit: Games Collaboratory and the support of Concordia University and Dawson College and financial contribution of the Ministère de l'Enseignement supérieur, de la Recherche, de la Science et de la Technologie.